For a startup, a lot is riding on the home page. You might be surprised, then, to learn that startups vary wildly in how quickly and reliably their website home pages load. That’s especially true when you look at load times on mobile devices. An increasing number of people use smartphones and tablets to browse the web, and yet — for some reason — the mobile versions of many startups’ sites lag far behind their desktop equivalents. Keynote Systems‘ new Startup Shootout Index provides some insight into the three-screen challenge now facing anyone with a web presence. It’s the first website performance index to measure load times and completion percentages on desktops, smartphones, and tablets simultaneously. 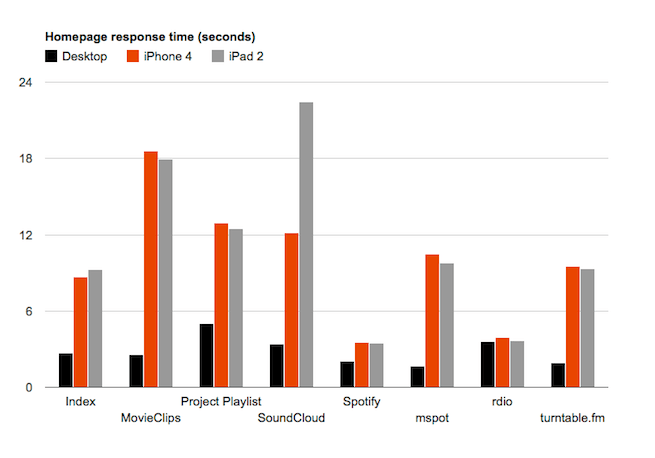 Full story: Startups struggle to keep their sites speedy on PCs, phones, and tablets | VentureBeat.